It is an obvious fact that water is essential to the sustenance of life. Yet, many homeowners neglect to take steps to improve their water quality. 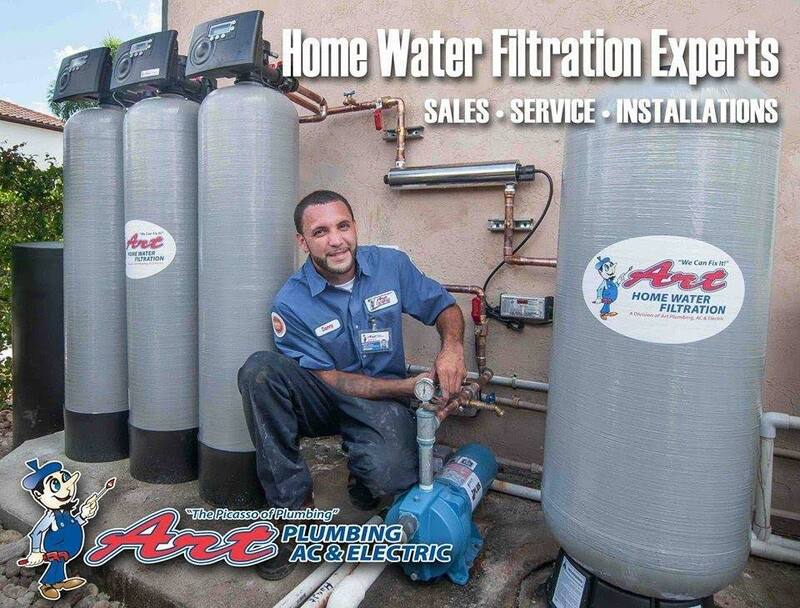 At Art Plumbing, AC & Electric, we know that the simple installation of a water treatment system can go a long way in ensuring excellent water quality for you and your family. Our comprehensive range of water treatment solutions is designed to deliver effective assistance for a variety of water quality problems. 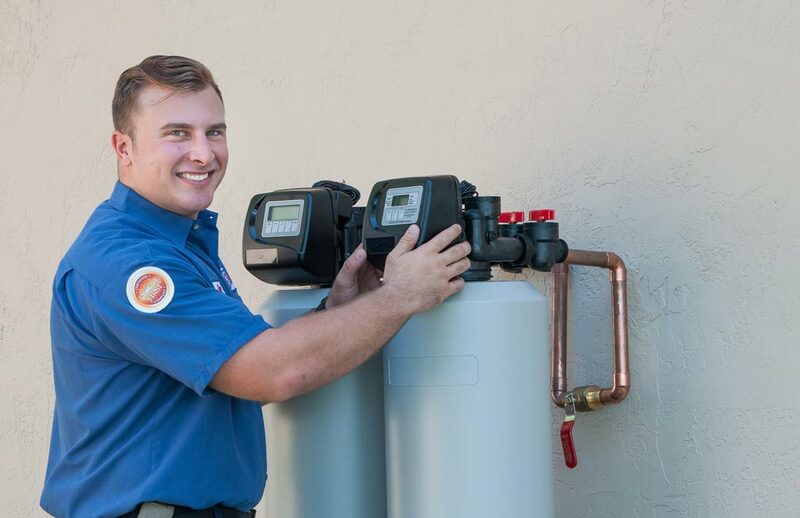 Before you explore our water treatment services, it is important first to grasp the kinds of water quality problems you are likely to experience as a homeowner. When precipitation occurs and water seeps into the ground, it dissolves and collects minerals, such as Calcium and Magnesium. Water with high mineral levels is referred to as ‘hard’ water. Hard water can result in mineral (scale) deposits on pipes and appliances, soap scum build-up in showers and baths, and decreased effectivity of soaps, shampoos and detergents, which require greater quantities to lather and clean effectively. The water supply can sometimes become contaminated by industrial chemicals from factories, harmful bacteria from farm animals, and other pollutants which seep into water supply sources. Even water treatment plants themselves can contaminate water with harmful by by-products. All this leads to deteriorating water quality, and could result in your home’s water supply being murky, unsafe, or foul-tasting. High concentrations of hydrogen sulfide can give your water an unpleasant odor, and increased iron levels could result in unsightly iron stains. A number of issues could contribute to cloudy water, so it’s best to consult a professional service like ours to address this problem. Art Plumbing, AC & Electric’s diverse water treatment services are here to solve all your water quality issues. If you’re experiencing water hardness, a water softener and conditioner will be necessary to correct this problem. Thankfully, Art Plumbing, AC & Electric’s trusted high efficiency electronic control valve will do just that. Art’s Pure Water Systems electronic control valve uses less water and less salt to correct water hardness and remove minerals, has adjustable cycle settings, and can be used on tanks up to 16”. With softer water, your soaps and detergents will work more efficiently, scum build-up will decrease, and your skin will be smoother! An alternative water softener is the twin tank water softener system. This system is able to provide uninterrupted, 24/7 soft water, thanks to its highly efficient tank-alternation system. When one tank is operational, the standby tank is being regenerated to remove minerals, so no time is wasted between cycles waiting for regeneration to be completed. Although you’d like to believe you receive water of an acceptable quality, the reality is that harmful chemicals, mineral after-tastes, and water hardness frequently result in substandard municipal water supply. Art Plumbing, AC & Electric’s tailored solutions empower homeowners receiving municipal water to take water treatment into their own hands. Our twin tank model allows for a two-stage process of chemical removal and water softening – tank one will take care of those nasty tastes and odors you’re experiencing, while tank two will soften your water to reduce scale and soap scum build-up. Our single, multiple-media tanks are able to remove chemicals, filter chlorine tastes and odors, and soften water in a single system. As water flows through the tank, it undergoes three treatment processes, making the system highly efficient and compact. The “troublesome trio” of Iron, Hydrogen Sulfide and Manganese are frequently a problem for well water users. Art’s Iron and Sulfur Killer systems are specially designed to deal with high mineral concentrations of well water supplies. Coupled with Art’s high efficiency metered head system accelerates the removal of minerals through oxidation by increasing air induction and using a high-pressure vessel. This results in more efficient filtering. If rotten-egg odors and high sulfur concentrations are your particular problem, sulfur shield technology will filter your water without requiring oxidizing chemicals, high maintenance or expensive chemical-feed pumps. If you’re looking for a natural solution to poor water quality, look no further. Pure light UV systems provide disinfection without using any chemicals, and can destroy bacteria and harmful viruses by up to 99%. These systems are especially suitable for commercial, residential, food service and aquiculture water treatment. If you’re concerned about the possible environmental impact of water treatment systems which waste water through backwashes and rely on salt and electricity to operate, then Art’s Green Treatment is your water filtration system of choice. The Green Treatment system is a two-tank model, which uses activated carbon and specially developed seed crystallization anti-scale media, to drastically reducing scale deposit formation. In this way, your appliances can be protected from scale deposits and your water softened, without harming the environment. Through a complex 6-stage filtration process, the Art’s Reverse Osmosis system filters out sediment, removes chemicals, chlorine and minerals through the NSF certified activated carbon media, and uses the reverse osmosis process to remove any remaining water contaminants. The advantages of this system include its wall-mount model, 75 gallons per day membrane, simple and sanitary cartridge removal process, plastic storage tank, and dedicated faucet. Alternatively, our compact, low-cost ultra-filtration drinking water system with its easily-removal twist ‘n turn cartridges and dedicated faucet is another highly effective option for chemical and bacteria removal water treatment.